Achille de Clemente, Florence (Lugt 521b); Ferruccio Asta, Venice (Lugt 116a); János Scholz, New York; Seiferheld and Co., New York; William B. O'Neal [1907-1994], Charlottesville, VA, May 1971; gift to NGA, 1991. 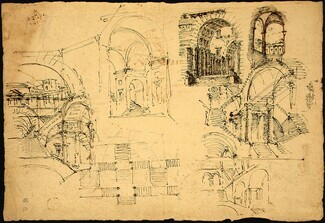 Master Drawings from the O'Neal Collection, Virginia Museum of Fine Arts, Richmond and tour, 1971-1972. Dürer to Diebenkorn: Recent Acquisitions of Art of Paper, National Gallery of Art, Washington, D.C., 1992, no. 47. Drawings from the O'Neal Collection, National Gallery of Art, Washington, 1993, no. 22.